Urgent message: Being an aggressive founder who is willing to take risks is invaluable when it comes to starting and growing a business. However, after that business becomes established, it’s essential to transition into a new role as a leader so those same traits that helped start the business don’t also ruin it. Leaving behind the relative safety of working as a physician in a hospital or private practice to start your own business can be scary. For those who aren’t a physician–entrepreneur, the risks and rewards of opening an urgent care center can be alluring. The thrill of owning and running your own business entices many to take the plunge and form a start-up. Traits like creative vision and risk-taking contribute to the success of any new business. A start-up must be carefully nurtured and steered in the right direction while financial, emotional, and reputational risks are necessary to increase its growth. 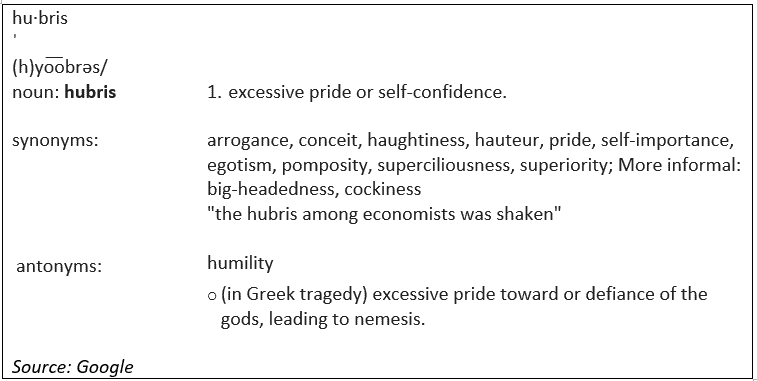 Executive hubris is how academics describe a CEO or business owner who displays extreme self-confidence, even over-confidence—in themselves and in their businesses. This leads to increased risk-taking, decreased cohesiveness among team members, and a demoralizing and demeaning company culture. It stems from two main sources: extensive power and the inability to let go of the thrill of start-up culture. Perhaps the owner–entrepreneur is on top of a company doing extremely well and rolling in profits. He or she may be more likely to take business risks, like a poorly timed acquisition or expansion, that may ultimately hurt the business. If the leader is stuck in the start-up mindset, he or she will likely take those same risks and, in addition, refuse to listen to the opinions or visions of others. Regardless of where it stems from, executive hubris is extremely damaging to both companies and employees. And it’s more common than you may think. Nearly one in five CEOs say they never doubt themselves, according to a study by the University of Oxford.1 While it’s good to have confidence, this rash overconfidence of “never doubting oneself” is extremely dangerous when it belongs to the individual in charge of running a business. Whether you run a small urgent care center or a growing portfolio of multiple centers, identifying and understanding how executive hubris can be a danger is not only practical, but essential. From an outsider’s perspective, it’s easy to see that running a start-up and running a successfully established business are not the same. However, for the physician–entrepreneur starting an urgent care center, the differences may not be so obvious. Growing the business from an idea into something viable and then something successful is a taxing process that leaves the owner very involved in a hands-on way. However, once a business becomes established, the owner must partially step back and transition into the role of “team member” rather than “one-man show.” Other professionals will step up to help run the business while the owner becomes the visionary and strategist, setting the future direction of the business. This transition is very difficult to make, leaving owners who still have an entrepreneurial mindset stuck in a pattern of thinking that results in executive hubris. Massive ride-sharing company Uber has made the news recently in light of scandals like secretly tracking its customers and having a company culture of unchecked sexual harassment. In part, this was due to founder and CEO Travis Kalanick having too much power and not running the business as part of an ethical and supportive team.2 Ultimately, this led to his removal as CEO and the appointment of new executives to run the company. This example from one of the fastest-growing companies in America shows urgent care owners the importance of taking practical steps to avoid executive hubris. Although doubt may seem like a negative in a business world where confidence is rewarded, doubt can also be one of the most powerful tools a leader possesses. Although 20% of CEOs said they don’t doubt themselves, fortunately, the other 71% said that they use their doubt as a decision-making tool. Strategies like scenario-planning and thinking about the bad things that may occur help successful CEOs manage the company’s risks. Although thinking about everything that could go wrong may not be as fun as envisioning boundless success, identifying the doubts that relate to a plan or idea leads to a much better decision-making than unchecked confidence. Practically any conference or seminar on business leadership will mention company culture in some way—because it is essential to creating and growing a successful company. Often, start-up companies have a very adventurous, daring, and risk-taking culture. This can resonate well or poorly with employees, depending on the mindset and philosophies of the founder. However, in time, it will lead to talented workers leaving and general unhappiness among those who remain. One of the most difficult things to do for a founder transitioning into a leadership/CEO role is to foster a culture that creates openness, collegiality, and diversity of thought among team members. As discussed earlier, being a CEO or leader of a business, specifically an urgent care center, requires tremendous teamwork and openness. If a physician opens an urgent care center, they should surround themselves with talented and intelligent individuals who will help run the company and make it stronger. This can only happen if the leader at the top provides a culture in which to do so. Team members should feel comfortable and motivated to provide opinions, even if they are not in line with the CEO’s vision. In addition, the leader should take these opinions seriously and reflect on them. Many people in many different positions can have great ideas, and it is the responsibility of the leader to hear these ideas and use them to guide the company in the right direction. At the same time, he or she should facilitate a company culture that promotes respect and achievement for all team members and the business as a whole. A strong dislike of criticism is listed as one of the signs of hubris. So, it only makes sense that learning to accept criticism and then consciously taking steps to better the object of the critique is an effective countermeasure. By allowing themselves to be critiqued, and in fact encouraging it, CEOs and business leaders can stay in touch with reality and help avoid executive hubris. For urgent care owner–operators, being an aggressive founder who is willing to take risks is important when it comes to growing a business. However, after that business becomes established, it is essential to transition into a new role as a leader so those same traits that helped found the business don’t harm it. Avoiding the trap of executive hubris that happens during this time of transition is something all owner-operators must be aware of and actively work on avoiding while simultaneously developing traits like teamwork and openness to better run the established company. Mackey J, Toye S. How leaders and their teams can stop executive hubris. strategy+business. Available at: https://www.strategy-business.com/article/How-Leaders-and-Their-Teams-Can-Stop-Executive-Hubris?gko=112ac. Accessed January 7, 2019. Kosoff M. Uber’s new CEO says Travis Kalanick was ‘guilty of hubris.’ Vanity Fair. Available at: https://www.vanityfair.com/news/2018/01/ubers-new-ceo-says-travis-kalanick-was-guilty-of-hubris. Accessed January 7, 2019. When founders go too far, by Steve Blank. Harvard Business Review. November–December 2017. Available at: https://hbr.org/2017/11/when-founders-go-too-far. The line between confidence and hubris, by Tim Lasseter. strategy+business. Spring 2017. Available at: https://www.strategy-business.com/article/The-Line-between-Confidence-and-Hubris?gko=c7827. How leaders and their teams can stop executive hubris, by Jonathan Mackey and Sharon Toye. strategy+business. Spring 2018. Available at: https://www.strategy-business.com/article/How-Leaders-and-Their-Teams-Can-Stop-Executive-Hubris?gko=112ac. Why great founders have ‘CEO hubris,’ by Zoe Henry. Inc. March 30, 2015. Available at: https://www.inc.com/zoe-henry/why-great-founders-have-ceo-hubris.html.